Cool kid violinist Roger Nelson doesn't give a damn about anything. Wannabe conductor John Fuchs is awkward, effeminate, and just figuring out he's gay. Despite their differences, they become friends - then lovers - and after college, they try to make it work. But it's the 1970s, and Roger can't bring himself to admit he's gay. Worse, after his brother is killed in Vietnam, Roger tries to live up to his memory and be the perfect son. Then after suffering one tragedy too many, he makes the biggest mistake of his life: Roger pushes John away. Through the years, they dance around the truth and in and out of each other's lives, never quite able to let go. Twenty years later, Roger still carries the pain of losing his dream of a brilliant career with him, while John is a superstar conductor with a wild reputation. John's off-stage antics get him plenty of attention, good and bad, though deep down, he wants only Roger. Finally determined to hold on to what really matters, Roger asks John for another chance, and when John panics and runs, Roger has to convince him to listen to his heart. We’ve met Roger and John as an established couple in the earlier books in this series. This is their (sometimes very painful) backstory. Roger and John met in high school. They were friends first, then lovers. They went on to college together where they roomed and got even more involved. But Roger couldn’t handle being “gay” (especially in the 70s) so he pushed John away and went on to marry a woman. John, meanwhile, did some self-destructive living in the 70s and 80s. They cross paths over the years, but its not until much later in life that Roger finally decides he’s able to admit once and for all that John is the true love of his life. This can be read as a stand-alone, but the entire series is really amazing, so I recommend reading it in order. 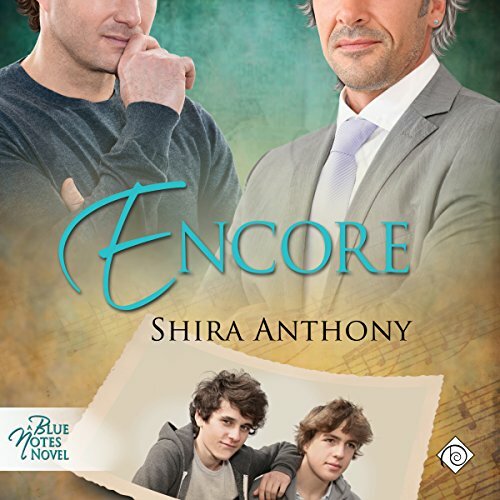 Shira Anthony is truly a gifted writer and this is a HARD book to read/listen to. There are so many issues covered – parental expectations, self acceptance, the Vietnam war, AIDS, losing a dream, finding out who you are, exploration, illness… so many things. She does all of this using music as a method of expression and it’s really beautiful. I read that Shira identifies with Roger as she’s changed professions from Opera singer to writer and Roger had to give up his musical career as well – it shows. The pain you feel for Roger (and John) is deep and very real. John and Roger love each other so much but it almost seems impossible for them to be with the other and for much of their lives they aren’t. To me, that’s what makes this book so damn difficult. I hate seeing MCs separated for such a long time and though Shira makes the reunion very sweet and powerful, it was hard while they were away from the other. Andrew McFerrin has done one other blue notes book and he’s really excellent. He does the accents, he’s able to even differentiate the young vs older MCs and his pacing is really good. I really enjoyed his interpretation of these characters and if you can stand it (again – this is a painful journey) I recommend the audiobook version as a way to experience this series.